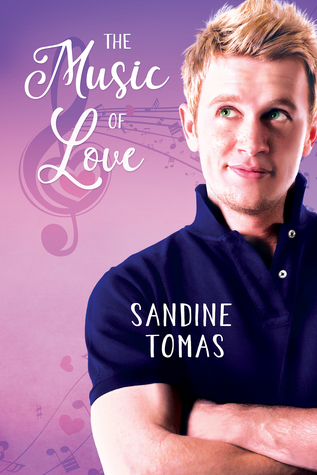 The Music of Love by Sandine Tomas was a very good Contemporary romance. There were a few things that I could have done without, but there were also things I enjoyed. This story is told from Julian’s POV. Julian works as a paralegal to pay the bills and is a songwriter and musician by night. His true passion is his music, but he finds himself working sixty-plus hours a week doing a job that he doesn’t necessarily enjoy but is very good at. Julian grew up in Texas. However, three disastrous relationships ending after a year have all had him running away to three different cities which eventually lands him in Washington D.C. He’s convinced that no man will ever love him past the one-year mark and he’s decided to give up on finding love. Plus the fact that he doesn’t want to move again has him set on avoiding any type of relationship outside of his two best friends and bandmates. The problem with this is that we don’t always know what fate has in store for us and sometimes love happens when you least expect it. Zachary who also hails from the great state of Texas joins the same firm Julian works at as a paralegal while studying to become a lawyer. He decided at an early age that he wanted to become a lawyer so he can valiantly help out the poor and underprivileged while owning his own firm some day. When his new boss sends him to meet his new partner on a lawsuit case, he’s immediately charmed by the hungover and oddly endearing hot mess that is Julian. He’s instantly smitten and wants this man to be his. Sparks fly from both sides, and even though Julian wants nothing more than to take the handsome and charming Zachary to bed, he decides that would be a mistake as he has a tendency to fall hard and fall fast. Which of course had led to disaster in the past and he’d rather just avoid it. He’s not willing to let history repeat itself. His heart can’t take another break. The storyline was good. I really thought the description of the characters’ surroundings were very spot on. I could picture where they were, and that was definitely pleasing. The secondary characters were very well thought out as well as their places in the story. They were a little infuriating at times when they decided to meddle, but that added realism to the story. The chemistry Julian and Zachary shared was very well written and beautifully expressed. The conflict would happen, and then it was over, which we all know is never that easy, and then all is well with the lovebirds. Some of the conflicts were more juvenile than what I’d expect from two grown men. It was almost a little too cliché on the main characters’ conflicts. I’ve definitely seen this all done before. I wish there was more depth to the storyline and not so much focus on having so many various conflicts. They fell head over heels pretty fast in the book and then it was like the focus became just entirely one drama after the next. The editing was great which I’ve come to expect of a Dreamspinner novel.